But this is one sister you might not want a blessing from! The stuff of every parochial schoolkids worst nightmares, this Sinister Sister Costume instantly transforms the innocent and pure bride of Christ into a demonic and terrifying mother of horror! During your school days, you always suspected that those sisters were secretly full of evil…from the way they wielded those rulers to the terrifying way they could stare you down on the schoolyard, you always had a bad feeling about whether they were for God or really served the Devil! Even when it came to the nice ones, you still had your doubts…after all, you find it almost impossible to believe that it’s humanly possible for anyone to be that nice and innocent all the time! And now you’ve got the proof! 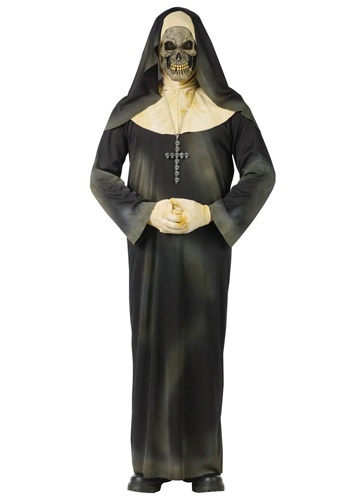 This Sinister Sister Costume features the classic black robe, which sports grey streaks and fits over the head, and the flesh colored wimple/veil exposes the face, leaving room for the skeleton mask (secured with a elastic band). The mask sports yellow and red stains for an extra creepy look. The costume even comes with flesh covered gloves and a cross necklace that’s made up of skulls, hung on a silver chain. So kick down those convent doors, spread the bad news, and “unmask” the truth about those sisters - this is one Halloween costume it’d be a “sin” to pass up! very scary , I 'm going to put on the costume party school , hope to win !!! !